Happy Friday lovelies! In my opinion there is no better season for accessories than fall. The colors and textures are so rich and luxe, which makes me feel instantly more chic when I'm wearing them. I've been trying not to go too crazy after my month of no shopping, so I was looking for a brand that had cute accessories at a lower price point, and I came across B.P. It's a brand carried by Nordstrom (in the Juniors section) that has new items what seems like every week! I love shopping the juniors section at Nordstrom because the quality is still usually pretty good, but the prices are much more reasonable than the women's section. 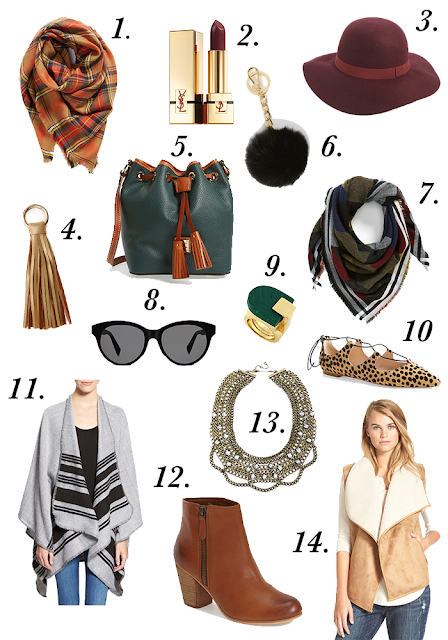 Most of the pretties on my fall accessory wish list are from B.P. or the juniors section, so no need to feel guilty about treating yourself! I hope you had a fabulous week and have an even better weekend!